Wouldn’t it be great to be able to walk into almost any photographic situation armed with a whole vocabulary of lighting techniques and be able to quickly select exactly the type of lighting you want for the main light of your photo? By understanding six key qualities of light you can create your own vocabulary of lighting to draw upon and apply for your desired effect in fashion photos, formal, and lifestyle portraits and beyond. Angle, Size, Distance, Shape, Duration, and Color are each qualities of light that photographers can combine and manipulate these qualities in setting the look of their photograph for impact beyond just illumination. The angle of lighting refers the amount of difference between angle that the main light hitting your subject relative to the line between camera and subject. The angle of difference can be small or great which will change both the amount and direction of shadow seen in the photo. As can be imagined, the greater degree of angle of lighting the more percentage of the subject will appear in shadow. A light placed above or near the lens will produce little or no shadow. The ultimate fixture for this effect is the ring flash which surrounds the lens and fires light at the same angle the lens sees the subject or model, but any type of light source close to the lens will reduce the amount of shadow. However, eliminating shadow is not necessarily the goal of good lighting. Shadow can be used to change a mode’s face or figure (for better or worse). The shots below demonstrate two different angles of lighting and the effects the angle gives. On the left a large soft light source is placed behind on the same angle as the camera just above and literally touching the lens which virtually eliminates shadow from the photo. It has the added effect of giving a sheen to the reflective nature of the gown the model is wearing. On the right the photo shows another soft light placed approximately 90 degrees from the angle of the camera producing strong side lighting and definite shadow. Lighting size is a function of the relationship between the surface area of the lighting fixture or modifier and the surface area of the subject. The larger the area of a lighting fixture is relative to the subject, the softer the output of that light as the light hits the subject at a greater number of angles and appears to wrap around the subject. A un-diffused speedlight has a surface area of about two square inches. The approximate area of the surface of a human face is 40-60 square inches. A speedlight is not going to produce soft lighting on a human face, yet to an ant it is more than enough to produce soft lighting. The general rule of thumb to create soft light is to have a light fixture with the surface area the same size or greater than the surface area of your subject. The photos below show two vastly different sizes of lighting fixtures. On the left the crisp light with sharply defined shadows is coming directly from a bare flash-tube and 7” silver reflector. 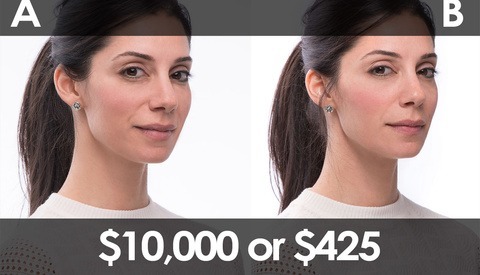 The shot on the right is lit with an extra large softbox measuring 4’x6’ so the soft light fills in the shadows and appears to wrap around the models face giving her a healthy glow. Small light sources can also include beauty dishes, optical spotlights, fresnel fixtures and bare bulbs. Soft lighting fixtures include windows, larger umbrellas and softboxes, scrim or diffusion panels with light coming thru them. 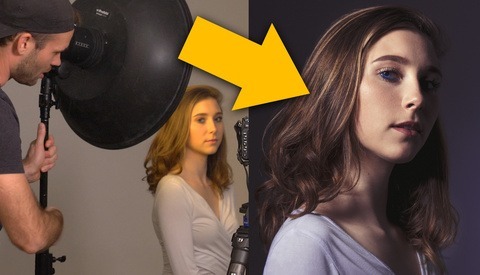 As much as angle, distance a lighting fixture is from the model can have a great effect on the ratio of highlight to shadow appears on the subject, otherwise known as falloff. The closer the light is to your subject the higher degree of falloff the light will have. A high degree of falloff means that light measurement from the highlight side of the subject (usually the face) to the shadow is a greater number of f-stops. When that number is greater than the dynamic range of your media (film or digital), a properly exposed highlight will have a corresponding shadow of black with no detail. With a smaller degree of falloff will have a properly exposed highlight with little change on the other side or a lighter shadow with detail. Distance also effects the softness of a light fixture. As a light is positioned further and further away, the less the surface area of the light (see above) is able to wrap around a subject and won’t be as soft as the same light would be close to the subject. 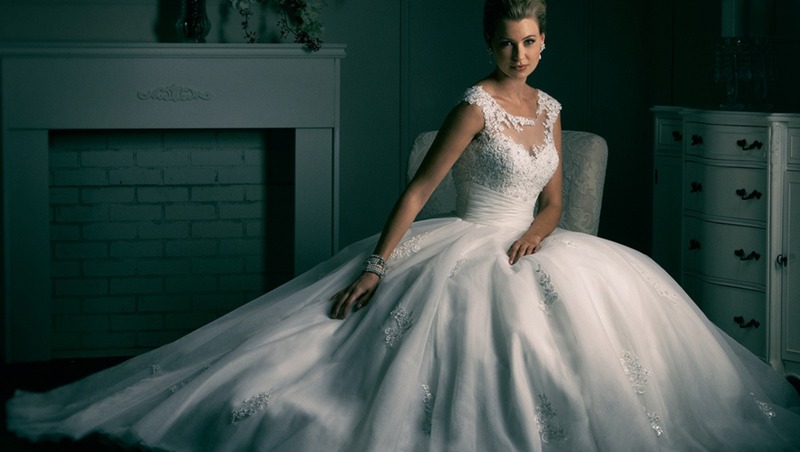 In the examples below, the first shows a model in bridal gown lit with medium sized softbox placed as close to the model as possible without being in the crop. The exposure runs quickly from properly exposed into deep shadow. The second image shows a model, also in a white gown lit by a larger light source (8’x8’ silk diffusion panel) that is well out of the frame. The exposure on either side of the model varies only a little. The background also shows only a slight difference from one side to the other. Shape refers to the path that light travels in order to get to the subject and has an effect on the quality of the light. Light leaving a fixture traveling straight to the subject is called directional lighting. The shadows on the subject correspond directly to the position of the lighting fixture or modifier. The path of even a soft source can be narrowed by using barn-doors and grids. Light leaving a source that is bounced or interrupted with diffusion will hit the subject at a greater number of angles and defeat the amount of shadows or possibly eliminate them. On the left the light in the shot is coming from multiple strobe heads bouncing off large white cards and wrapping around the model. 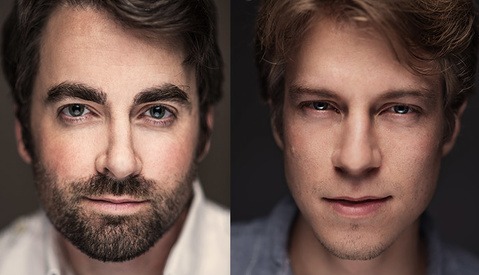 The shot on the right has a clear direction to the light and was created by the beam of a softbox with an egg-crate grid on the face of it narrowing that beam. In general terms, there are two big choices here: Strobe and Constant light. Putting aside flickering light and high speed sync, a lot of photographic situations come down to using a strobe to freeze an image onto the media or striking a balance between f-stop and shutter speed with constant light from the sun or an artificial source. Most electronic strobes fire between 1/200 and 1/8000 which is generally enough to stop most action. 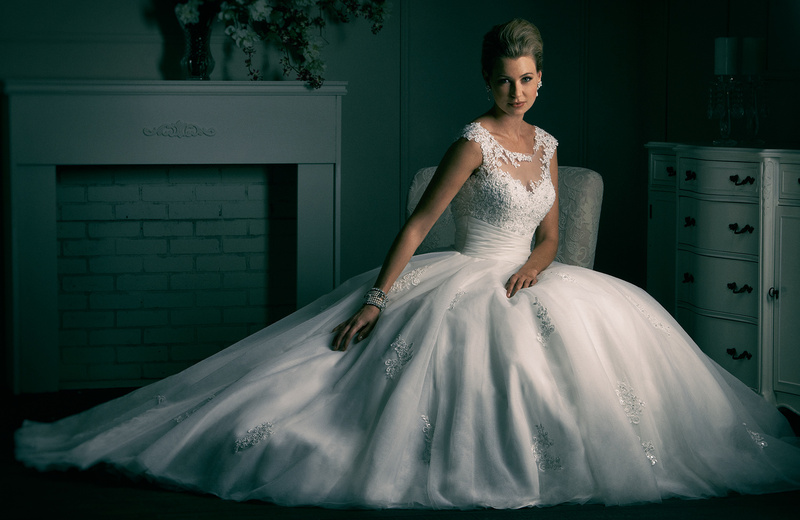 Strobes are also more efficient and consistent sources of lighting for photos. Constant lighting has it’s advantages too, a major being WYSIWYG. And of course strobe and constant lighting can be combined in the same shot. The shot below uses both strobe and constant light to capture both the model and deepen the density in the sky and freeze the splash. To combine strobe and ambient light, the strobe exposure on the model is controlled by the f-stop and the ambient exposure of the sky is controlled by the shutter speed and can generally be manipulated without changing the light value on the model. The color of light can be judged in two major ways. First, the degree that the light balances to the color temperature sensitivity of the media (daylight and tungsten film or white balance in digital). Secondly, whether the light is filtered (gelled) or white. Color temperature balancing produces results the way our eyes see, buy playing with that balance can produce interesting effects as well. Whether it is a warming filter or late day sunlight to produce an amber glow or watching the color temperature of the light and the media to produce green or blue tones, color temperature is another choice I consider when creating a shot. The mood in the shot below was created simply by swapping color temperature settings between tungsten and strobe. The camera was set to tungsten of approximately 3100k, and the strobe was firing at approximately 5100k producing the blue tone. Beyond individual lighting fixtures or modifications, knowledge of these qualities can help all photographers add quality and variety to their lighting kit. Once a photographer is comfortable manipulating these individual qualities they can develop their own vocabulary of lighting by combining the qualities into specific approaches. I used to prefer Side angle, small size, high falloff, directional lighting, but now I find myself more drawn to 45 degree angle, extra large, soft falloff, diffused lighting. Being comfortable with these variables and these effects saves me a lot of time on set when deciding lighting style for an individual shot. Dan Howell has been a New York City area photographer specializing and fashion and portraits for catalogs and magazines for the past 20 years. He began photography with photojournalistic aspirations but found a more comfortable fit in the fashion and commercial world. Networking Versus Self-Promotion: Which Helps Your Photography Business Grow Faster? 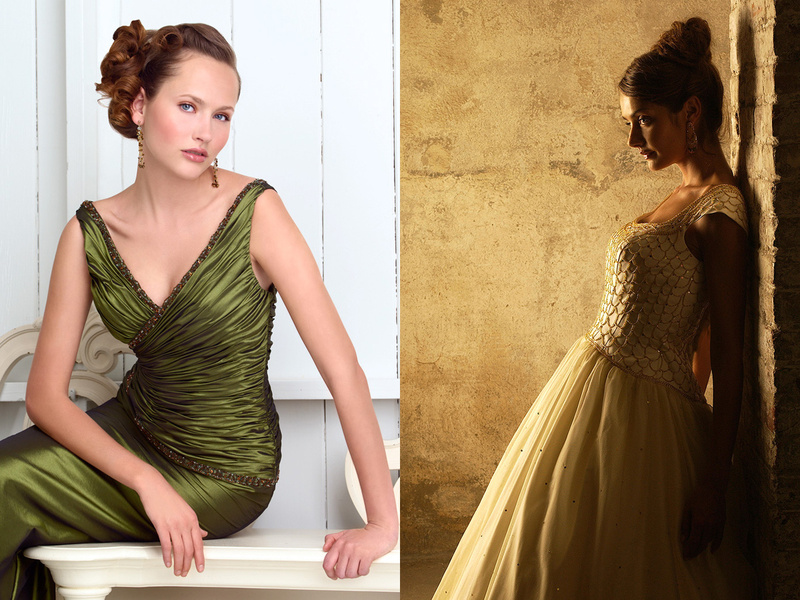 Planning Versus Improvisation: Are You a Planner or Just Winging It on Your Photoshoots? Thank you, I found this to be a very useful article. Hi Dan, Thanks for this instructive article. Really, enjoy your guidelines. I am optimistic to use this qualities when i capture any photos. Great Dan thanks. Clear and helpful article.